Convergence gave us the smartphone that was also a camera and media player, and now Lenovo’s Yoga Book C930 wants to do the same for the larger gadgets that currently fill up your bag. The dual-screen clamshell cherry-picks the best of LCD, E Ink, and digital pen technology, encapsulating them all in an unusually compact design. That might be enough to help oust four other devices from your carry-on. Lenovo is positioning the Yoga Book C930 as a traveller’s best friend, and certainly we can see why that would be true. After all, with a footprint smaller than a standard US letter-sized piece of paper, not to mention it being under 1.8 pounds, we’re talking about one very light notebook. Still, the same could be said about the original Yoga Book, so why is this second-generation model so much better? That comes down to performance. With the first-generation notebook, Lenovo prioritized frugality: that way, with its Atom CPU it could achieve lengthy runtimes. At the same time, however, it ran into criticisms about just how productive you could be with such a low-power chip. Yes, as we ourselves found, you could use a Yoga Book as your everyday computer, but it wasn’t a pain-free process. Lenovo isn’t making the same mistake again. This time around there’s a choice of 7th Gen Intel Core m3-7Y30 and Core i5-7Y54 processors. No, they’re not going to be doing much gaming, but they’ll undoubtedly be much faster at things like Office, web browsing, managing your email, and digital art and note-taking. The Intel HD Graphics 615 will be able to drive an external USB-C display, too. The limiting factor may well be the keyboard. Lenovo has added some ways to give feedback every time you strike an E Ink key – both sound and visual – but you’re still tapping on a perfectly flat surface. If you’re an adept tablet typist, that might not be too much of a hurdle. If, though, you’re a touch typist who needs those physical keys in order to orient your fingers, you may have some problems. Convertible notebooks are a great idea. After all, why carry two devices around with you – your laptop and your tablet – when one can serve double-duty? All the same, it doesn’t take too much for them to go from good concept to terrible execution. If it’s too thick, or too heavy, you’re simply not going to use it in tablet orientation. The Yoga Book C930’s low weight certainly helps there, as does the fact that, at just 0.38-inches thick, it’s not oddly thick to hold. Best of all, though, is the screen size. The 10.8-inch LCD touchscreen is more akin to a regular tablet than a folded notebook, but you don’t sacrifice on resolution in the process. Indeed, you’re actually getting more pixels from the Yoga Book C930 than you do in an iPad Pro 10.5. Plenty of people read ebooks on LCD and OLED screens, but if you really want to replicate the traditional book experience you need e-paper. With its secondary E Ink touchscreen and that 360-degree hinge, the Yoga Book C930 could replace your Kindle, though it may be a little awkward at first. For the moment, unfortunately, you can’t just load up Amazon’s Kindle app for Windows. 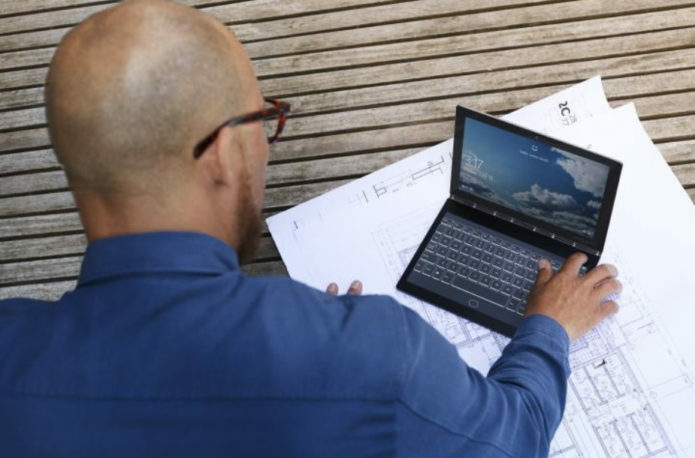 Indeed, while doing that would deliver the same user-experience as a dedicated Kindle does – and if you had the LTE version of Lenovo’s notebook you’d be able to download ebooks on the move, too, regardless of whether you were in range of a WiFi network – when the Yoga Book C930 ships it won’t be so flexible. Instead Lenovo will have an app that can be used to read and annotate PDFs. Come early 2019, the company promises, it’ll expand that to support the more typical ebook formats. That’s still not as good as the regular Kindle app, no, but it’s better than nothing. One huge advantage to using the Yoga Book C930 as an ereader is battery life. E-paper has incredibly conservative power requirements: it only demands juice when it’s changing, in fact. Given the 35.8 Wh battery Lenovo has squeezed inside, you should be able to do a whole lot of reading before you need to reach for the USB-C charger. Lenovo quotes 8.6 hours of runtime from a charge, but that’s assuming you’re using the LCD screen. With that turned off, and E Ink’s low power needs, you could easily be looking at several multiples of that. The first-generation Yoga Book was designed to make sketching and note-taking more straightforward, but it did that in a fairly clumsy way. In fact, it still required paper. Lenovo included a pad of paper which could be magnetically attached to the convertible’s Halo Keyboard, and – with an ink tip inserted into the stylus – you could both write paper notes and have a digital version stored at the same time. Happily, the Yoga Book C930 streamlines things considerably. Gone is the awkward paper notepad which prevented the original Yoga Book from closing: you don’t need it, since the E Ink screen can show exactly what you’re writing and sketching in real-time. The active stylus also works on the upper touchscreen. That was one of the more frequent criticisms from first-generation Yoga Book owners, who didn’t like having to set down their stylus in order to interact with the LCD screen. Best of all, the software joins both screens together. For example, you can take notes on the E Ink panel and then, with the tap of a virtual button, transfer them up to the regular screen. That makes filing things in OneNote much easier, but will actually work to paste into any Windows app. Or, you can have your handwriting converted into text, which could be a lot more useful. As was the case with the first Yoga Book, this second-generation model is undeniably not for everybody. The zero-profile keyboard could be a deal-breaker for typists, or the still-frugal specifications for those needing more serious apps. All the same, you can’t argue that Lenovo hasn’t listened to the feedback and, in almost all cases, addressed it. It leaves the Yoga Book C930 feeling like less of a gimmick and more of a very niche laptop. If you’re currently traveling with your notebook, tablet, an ereader, and a paper notebook, the potential to replace all four of those with a single device has to be tempting. That’s before you get to things like watching movies with Dolby Atmos audio. Is that worth $999.99? That’s the biggest question. We’ll have a full review of the Lenovo Yoga Book C930 soon.